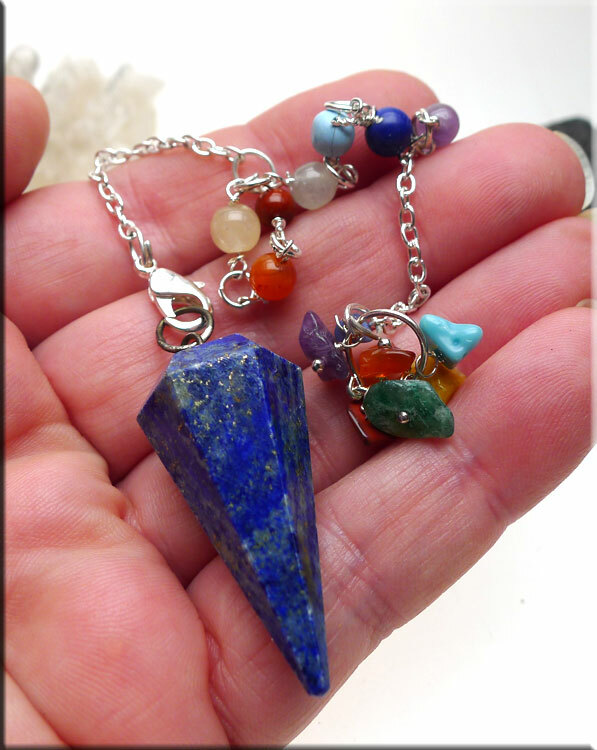 Lapis Lazuli Chakra Pendulum - Pendulums are powerful metaphysical tools. 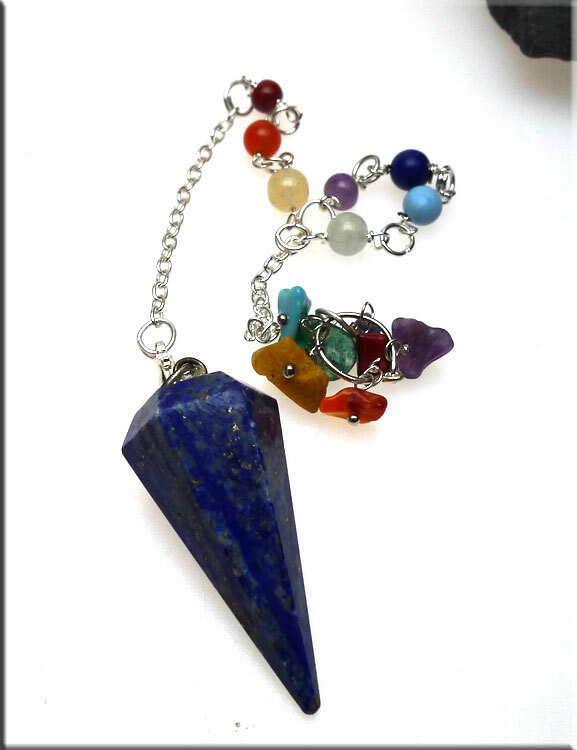 These Gorgeous Chakra Gemstone Pendulums feature Genuine Lapis Lazuli with very nice Pyrite Inclusions. Each pendulum is hand-crafted of natural gemstone materials so variations should be expected. 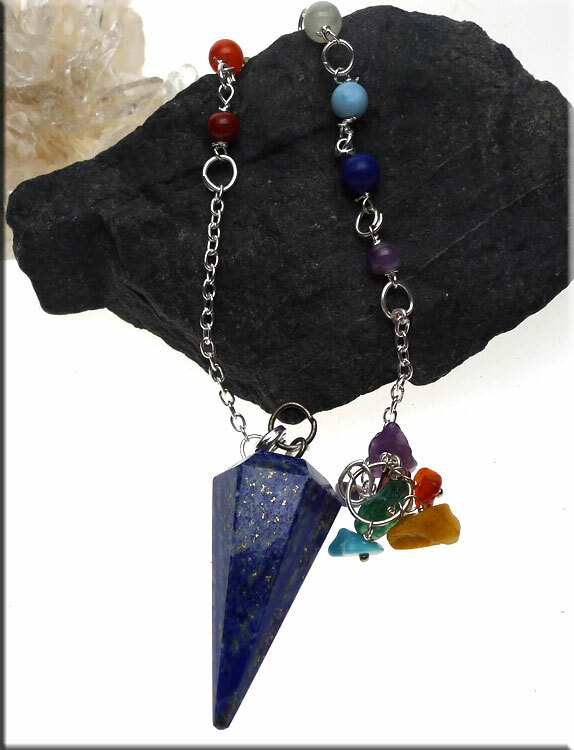 These pendulums have a range of stones wrapped into the silver plated chain including : Amethyst, Sodalite, Turquoise Howlite, Moonstone, Citrine, and Red Jasper. The bob has a variety of Gemstone Chips as well. Overall these pendulums measure 9-inches to 10-inches in length. Lapis - a.k.a. : Lapis Lazuli - is the traditional birthstone for December. An ancient stone prized for many properties: It brings a higher guidance and intuition; helps one to connect to the Higher Self; helps to organize and quiet the mind and brings self expressions; helps with dream insights, writing and creativity... Said to calm the nervous system, helping with anxiety and insomnia. It also used to aid with autism, speech and hearing difficulties. During ancient times lapis lazuli was ground up and used for medicinal purposes as well as a popular cosmetic -- eyeshadow! During the Middle Ages, lapis lazuli was believed to maintain the skeleton in healthy condition while keeping the spirit free from the negative emotions of fear and jealousy. Maybe ~ a diagonal direction, from the lower left to upper right of the circle. Don't Want To Answer ~ a diagonal direction, from the lower right to the upper left of the circle.